Perfect for hospitality and healthcare industries. Cost effective, puncture-resistant bags hold wet or damp linens. Bags dissolve completely in water at 140°F. Fits 18" hamper. Won’t damage fabrics, equipment, or waste water treatment systems. Highly resistant to most organic solvents, greases, fats, and oils. Impervious to most gases. Will not generate a static charge. Use attached tie-tape to close. 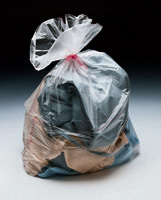 Call us for details about cold water-soluble bags.